If you missed out, or even if you didn’t, here’s how I am going to make it up to you. I am going to start posting trivia questions *not* yet published to this forum periodically. Each question will have the opportunity to be answered in the comments. The first person who posts a correct answer will get an entry into a contest for a free autographed paperback copy of Ron El’s Comic Book Trivia Volume 1. The contest will run until the date of the release for the next volume of the series (presently scheduled for release by April 7, 2013). 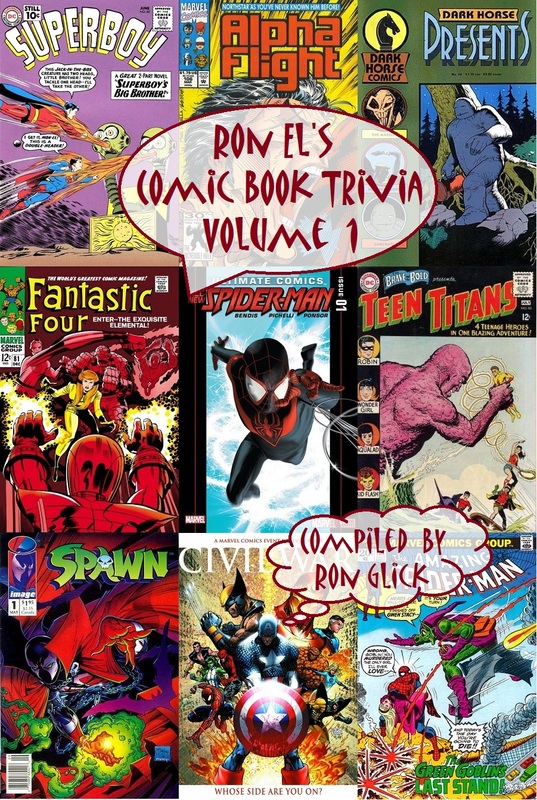 All of these questions will be from the content of Ron El’s Comic Book Trivia Volumes 5, so you will in effect be getting a sneak peak of the upcoming volume (and yes, all of those questions are already written) – and people will not be required to make a purchase to participate. Because this is not a speed-entry format, spelling and specifics are important. If there are multiple characters of the same name, you must specify which one you are naming. For instance, if the answer is Robin, you will need to specify which Robin (I, II, III, IV, V, or alternate future/reality version). I will post the winner of each question, so if you do not see a post from myself, assume the question has not been answered correctly yet. One final rule: members of The Creators guild on The Settlers Online (past or present) are disqualified from this contest, as they have already been provided these answers. So it’s time to bookmark this page so that you can check daily for new trivia questions.